Ultimate Masters brings back some of the most powerful cards from throughout Magic history. Ultimate Masters is designed to provide an exciting and unique Limited experience with cards that have never been drafted together. The Ultimate Masters set contains 254 cards (101 common, 80 uncommon, 53 rare, and 20 mythic rare). Go to Wizards.com/Locator to find an event or store near you. Inclusion in the Ultimate Masters set doesn't change what other formats a card is legal in. The majority of its cards are not legal in the Standard format, and many are not legal in the Modern format. Go to Magic.Wizards.com/Rules for a complete list of formats and permitted card sets. Each Ultimate Masters booster display contains 24 booster packs, plus one Ultimate Box Topper card in its own wrapper. This premium card with its unique frame is chosen at random from among 40 cards that appear in the Ultimate Masters set. The Ultimate Box Topper is in English. It's legal for tournament play the same as any other card in the Ultimate Masters set, although it's not intended to be drafted. See magic.wizards.com/products/ultimate-masters for a list of the 40 cards. All cards in the Ultimate Masters set have previously appeared in other Magic sets. Accordingly, several keywords and other mechanics make their return. None of the rules regarding these mechanics have changed since they last appeared. The ravenous Eldrazi from the Rise of the Eldrazi set show off their insurmountable hunger with the annihilator keyword, forcing your opponent to sacrifice permanents when these creatures attack. Annihilator abilities trigger and resolve during the declare attackers step. The defending player chooses and sacrifices the required number of permanents before they declare blockers. Any creatures sacrificed this way won't be able to block. If a creature with annihilator is attacking a planeswalker, that planeswalker's controller is the defending player. If they choose to sacrifice that planeswalker, the attacking creature continues to attack. It may be blocked. If it isn't blocked, it simply won't deal combat damage to anything. Annihilator abilities don't target any player or permanents. The defending player sacrifices permanents even if that player or their permanents have hexproof or protection from the attacking creature. The delve keyword returns from the Khans of Tarkir block, letting you fuel your spells with the cards in your graveyard. Delve doesn't change a spell's mana cost or converted mana cost. For example, Treasure Cruise's converted mana cost is 8 even if you exiled three cards to cast it. You can exile cards to pay only for generic mana of the spell with delve. You can't exile more cards than the generic mana requirement of a spell with delve. For example, you can't exile more than seven cards from your graveyard to cast Treasure Cruise unless an effect has increased its cost. Because delve isn't an alternative cost, it can be used in conjunction with alternative costs, such as flashback. It can also be used to pay for additional costs that include generic mana. Some spells just don't stay buried. The dredge keyword, originally featured in the Ravnica: City of Guilds set, lets you trade cards from your library to return a card from your graveyard. Dredge can replace any card draw, not only the one during your draw step. If an effect puts a card into your hand without specifically using the word "draw," you're not drawing a card. Dredge can't replace this event. One card draw can't be replaced by multiple dredge abilities. You can't attempt to use a dredge ability if you don't have enough cards in your library. Once you've announced that you're applying a card's dredge ability to replace a draw, players can't take any action until you've put that card into your hand and put the top cards of your library into your graveyard. If you're drawing multiple cards, each draw is performed one at a time. For example, if you're instructed to draw two cards and you replace the first draw with a dredge ability, another card with a dredge ability (including one that was put into your graveyard by the first dredge ability) may be used to replace the second draw. Creatures with the evoke keyword, first featured in the Lorwyn set, have an effect either when they enter the battlefield or when they leave the battlefield. By casting one for its evoke cost, you'll get that effect without keeping the creature around. Evoke is an alternative cost to cast the spell with evoke. It can't be combined with other alternative costs, such as casting a spell "without paying its mana cost." To determine the total cost of a spell, start with the mana cost or alternative cost (such as an evoke cost) you're paying, add any cost increases, then apply any cost reductions. The converted mana cost of the spell remains unchanged, no matter what the total cost to cast it was. If a creature with evoke enters the battlefield without being cast, you won't have to sacrifice it. The ability that causes you to sacrifice an evoked creature is a triggered ability. Players may respond to this triggered ability while the creature is still on the battlefield. If you evoke a creature with an enters-the-battlefield trigger, you choose the order in which those triggered abilities resolve. Creatures with the exalted keyword, originally appearing in the Shards of Alara set, empower a creature that is brave enough to attack alone. If you declare exactly one creature as an attacker, each exalted ability on each permanent you control (including, perhaps, the attacking creature itself) will trigger. You must attack with exactly one creature for exalted abilities to trigger. Exalted abilities won't trigger if you attack a player with one creature and a planeswalker with another, for example, or if you attack with two creatures but one is removed from combat. Some effects put creatures onto the battlefield attacking. Since those creatures were never declared as attackers, they're ignored by exalted abilities. They won't cause exalted abilities to trigger. If any exalted abilities have already triggered (because exactly one creature was declared as an attacker), those abilities will resolve as normal even though there may now be multiple attackers. In a Two-Headed Giant game, a creature "attacks alone" if it's the only creature declared as an attacker by your entire team. If you control that attacking creature, your exalted abilities will trigger but your teammate's exalted abilities won't. It's no surprise to see the flashback keyword return, especially with this set's light graveyard theme! This keyword has appeared in many sets to let you cast a spell one more time. Create a 1/2 green Spider creature token with reach for each creature card in your graveyard. You must still follow any timing restrictions and permissions, including those based on the card's type. For instance, you can only cast a sorcery using flashback when you could normally cast a sorcery. To determine the total cost of a spell, start with the mana cost or alternative cost (such as a flashback cost) you're paying, add any cost increases, then apply any cost reductions. The converted mana cost of the spell remains unchanged, no matter what the total cost to cast it was. A spell cast using flashback will always be exiled afterward, whether it resolves, is countered, or leaves the stack in some other way. You can cast a spell using flashback even if it was somehow put into your graveyard without having been cast. Aura spells target the creature they'll enchant. They'll cause heroic abilities to trigger. A heroic ability will resolve before the spell that caused it to trigger. It resolves even if that spell is countered. A heroic ability will trigger only once per spell, even if that spell targets the creature with the heroic ability multiple times. Heroic abilities won't trigger when a copy of a spell is created on the stack or when a spell's targets are changed to include a creature with a heroic ability. The madness ability has worked its way into several sets in Magic's past. If you discard a card with madness, you get a chance to cast it instead of just putting it into your graveyard. Cards are discarded in a Magic game only from a player's hand. Effects that put cards from a player's library into that player's graveyard do not cause those cards to be discarded. A spell cast for its madness cost is put onto the stack like any other spell. It can be countered, copied, and so on. As it resolves, it's put onto the battlefield if it's a permanent card or into its owner's graveyard if it's an instant or sorcery card. Casting a spell with madness ignores the timing rules based on the card's card type. For example, you can cast a sorcery with madness if you discard it on an opponent's turn. To determine the total cost of a spell, start with the mana cost or alternative cost (such as a madness cost) you're paying, add any cost increases, then apply any cost reductions. The converted mana cost of the spell remains unchanged, no matter what the total cost to cast it was. Madness works independently of why you're discarding the card. You could discard it to pay a cost, because a spell or ability tells you to, or even because you have too many cards in your hand during your cleanup step. You can't discard a card with madness just because you want to, though. When you cast a card with madness, it was still discarded. If it was discarded to pay a cost, that cost is still paid. Abilities that trigger when a card is discarded will still trigger. If you choose not to cast a card with madness when the madness triggered ability resolves, it's put into your graveyard. You don't get another chance to cast it later. If you discard a card with madness to pay the cost of a spell or activated ability, that card's madness trigger (and the spell that card becomes, if you choose to cast it) will resolve before the spell or ability the discard paid for. If you discard a card with madness while resolving a spell or ability, it moves immediately to exile. Continue resolving that spell or ability—the card is not in your graveyard at this time. Its madness trigger will be placed onto the stack once that spell or ability has completely resolved. It's hard to keep a good creature down. The persist and undying keywords each let a creature get back on its feet (or wings, tentacles, etc.) when it dies so that it can fight one more time. Persist and undying function identically other than which counter is considered. The following notes apply to both keywords, considering the appropriate kind of counters for that keyword. If a card with persist or undying is removed from the graveyard after it dies but before the ability trigger resolves, it won't be returned to the battlefield. If a creature has multiple instances of persist and/or undying, they'll each trigger separately, but once one of those abilities returns the card to the battlefield, any others will have no effect. It won't receive multiple counters. If a token has persist or undying, the ability will trigger when the token dies. However, the token can't return to the battlefield. Once the creature returns, it's considered a new object with no relation to the object that it was. Auras that were attached to it won't return to the battlefield. Equipment that was attached to it will remain unattached. Any counters that were on it won't be put on the new creature. If multiple creatures with persist or undying die at the same time, the active player (the player whose turn it is) puts all of their triggers on the stack in any order, then each other player in turn order does the same. The last trigger put on the stack is the first one that resolves. That means that in a two-player game, the nonactive player's persist and undying creatures will return to the battlefield first, then the active player's persist and undying creatures will come back. The creatures return one at a time. If a creature has a -1/-1 counter on it and a +1/+1 counter is put onto it, those counters are each removed as a state-based action. If it has more of one kind of counter than the other, the difference remains on that creature. If a creature has persist and a +1/+1 counter on it, and that creature receives enough -1/-1 counters to cause it to die, persist doesn't trigger. Protection is an ability that appeared regularly in Magic sets in the past. It encompasses a few different ways to render a permanent safe from other objects. Target creature you control gains protection from the color of your choice until end of turn. Scry 1. Damage that would be dealt to that permanent by a source of that color is prevented. Auras and Equipment of that color can't be attached to that permanent. Creatures of that color can't block that permanent. That permanent can't be the target of spells of that color or abilities of sources of that color. Nothing other than the specified events is prevented or illegal. A creature with protection from white is destroyed by Akroma's Vengeance; a creature with protection from black will get -1/-1 from the effect of Death's-Head Buzzard; and a creature with protection from red gains menace from Goblin War Drums. A permanent gaining protection may cause a spell or ability on the stack to have an illegal target. As a spell or ability tries to resolve, if all its targets are illegal, that spell or ability doesn't resolve. None of its effects happen, including effects unrelated to the target. If at least one target is still legal, the spell or ability does as much as it can to the remaining legal targets, and its other effects still happen. Some cards grant protection from "a color of your choice." You can't choose "artifact" or "colorless" this way, since those are not colors. Some creatures won't give up so easily. Regenerate is a keyword action that spares a creature from destruction. Discard a card: Regenerate Patchwork Gnomes. When you regenerate a permanent, you're creating a replacement effect "shield" to be used later. That effect means "The next time [that permanent] would be destroyed this turn, instead remove all damage marked on it and tap it. If it's an attacking or blocking creature, remove it from combat." A permanent can regenerate even if it's already tapped. A permanent that regenerates doesn't leave or enter the battlefield. Abilities that trigger on a creature dying or entering the battlefield won't trigger if a creature regenerates. Permanents are destroyed by effects that use the word "destroy." Creatures are also destroyed by having lethal damage marked on them. Sacrificing a permanent doesn't destroy it, nor does reducing a creature's toughness to 0. If a permanent would be destroyed in two ways at once, one regeneration shield protects it from both. This will happen, for example, if a creature with deathtouch deals damage to a creature greater than or equal to that creature's toughness. Arcane is a spell subtype that first appeared in Champions of Kamigawa. It has no meaning by itself, but some Arcane spells have splice onto Arcane, letting you add their effects together for a more explosive spell! You reveal all cards you intend to splice at the same time. Each individual card can be spliced onto any one spell no more than once. You choose the order for the effects of spliced cards to occur. They all happen after the original spell's effects. A card with a splice ability can't be spliced onto itself because the spell is on the stack (and not in your hand) when you reveal the cards you want to splice onto it. You choose all targets for the spell after revealing cards you want to splice, including any targets required by the abilities from any of those cards. You may choose a different target for each instance of the word "target" on the resulting spell. Other than the effects added to the spell, no information about the cards spliced onto it is added. The spell's color is unaffected, and its converted mana cost is still based only on its own mana cost. The cards spliced onto the spell remain in your hand. They're not affected if the spell is countered. If a spell is copied, the copy has the same cards spliced onto it as the original spell in the same order. If all of the spell's targets are illegal when the spell tries to resolve, it doesn't resolve at all. None of its effects will happen, even untargeted effects from the original card or the cards spliced onto it. If some (but not all) of a spell's targets are illegal when the spell tries to resolve, the spell does as much as possible. Ignore any effects for the illegal targets. Returning from the Rise of the Eldrazi set, Auras with the totem armor keyword provide an extra degree of defense. Totem armor's effect is mandatory. If the enchanted permanent would be destroyed, you must remove all damage from it (if it has any) and destroy the Aura that has totem armor instead. Totem armor's effect is applied no matter why the enchanted permanent would be destroyed: because it's been dealt lethal damage, or because it's being affected by an effect that says to "destroy" it (such as Maelstrom Pulse). In either case, all damage is removed from the permanent and the Aura is destroyed instead. If a permanent you control is enchanted with multiple Auras that have totem armor, and the enchanted permanent would be destroyed, one of those Auras is destroyed instead—but only one of them. You choose which one because you control the enchanted permanent. If a permanent enchanted with an Aura that has totem armor would be destroyed by multiple state-based actions at the same time (most likely because a creature with deathtouch has dealt damage to that creature greater than or equal to its toughness) totem armor's effect will replace all of them and save the creature. If a spell or ability (such as Akroma's Vengeance) would destroy both an Aura with totem armor and the permanent it's enchanting at the same time, totem armor's effect will save the enchanted permanent from being destroyed. Instead, the spell or ability will destroy the Aura in two different ways at the same time, but the result is the same as destroying it once. Totem armor's effect is not regeneration. Specifically, if totem armor's effect is applied, the enchanted permanent does not become tapped and is not removed from combat as a result. Effects that say the enchanted permanent can't be regenerated (as Putrefy does) won't prevent totem armor's effect from being applied. If you regenerate a permanent you control that's enchanted by an Aura with totem armor, you choose which effect applies. If you apply the regeneration shield, the Aura remains attached. If a spell or ability says that it would "destroy" a permanent enchanted with an Aura that has totem armor, that spell or ability is what causes the Aura to be destroyed instead. Totem armor doesn't destroy the Aura; rather, it changes the effects of the spell or ability. On the other hand, if a spell or ability deals lethal damage to a creature enchanted with an Aura that has totem armor, the game rules regarding lethal damage cause the Aura to be destroyed, not that spell or ability. If a permanent enchanted with an Aura that has totem armor has indestructible, lethal damage and effects that try to destroy it simply have no effect. Totem armor won't do anything because it won't have to. Aethersnipe can be the target of its own ability. If it's the only nonland permanent on the battlefield, it must be the target of its ability. A land card that produces colored mana, even a land with a basic land type, normally has no color. Angelic Renewal's ability triggers if a creature you own dies under another player's control. If multiple creatures are put into your graveyard at once, Angelic Renewal triggers multiple times, but it can only be sacrificed once and only brings back one creature. If Angelic Renewal leaves the battlefield before its triggered ability resolves, you won't be able to sacrifice it and the creature can't be returned to the battlefield. If an animated permanent that's not normally a creature is put into your graveyard from the battlefield, Angelic Renewal can return that card to the battlefield. If a token creature is put into your graveyard from the battlefield, you can sacrifice Angelic Renewal, but nothing will be returned to the battlefield. If a card in a player's hand has X in its mana cost, X is considered to be 0. B, T, Sacrifice Apprentice Necromancer: Return target creature card from your graveyard to the battlefield. That creature gains haste. At the beginning of the next end step, sacrifice it. Apprentice Necromancer can't be the target of its own ability. This is because targets are chosen for activated abilities before costs (such as "Sacrifice Apprentice Necromancer") are paid. If an instant or sorcery spell puts Archaeomancer onto the battlefield, its ability can target that card in your graveyard. Resolving Arena Athlete's ability after a creature has blocked won't remove the blocking creature from combat or cause the creature it blocked to become unblocked. The damage dealt by Balefire Dragon's triggered ability isn't combat damage. If the target card becomes an illegal target for Beckon Apparition, the spell doesn't resolve. You don't create a token. If the target permanent or player becomes an illegal target for Blast of Genius, the spell doesn't resolve. You don't draw or discard any cards. If a discarded card has X in its mana cost, X is considered to be 0. You can sacrifice Bloodflow Connoisseur to pay the cost for its own ability. In this case, nothing happens as the ability resolves. The ability that defines Boneyard Wurm's power and toughness works in all zones, not just the battlefield. If Boneyard Wurm is in your graveyard, it will count itself. You choose an opponent while Canker Abomination is entering the battlefield. No player may take actions between the time you choose the opponent and the time Canker Abomination gets -1/-1 counters. You must choose an existing creature type, such as Human or Warrior. Card types such as artifact can't be chosen. The spell can't be countered if the mana produced by Cavern of Souls is spent to cover any cost of the spell, even an additional cost such as a kicker cost. This is true even if you use the mana to pay an additional cost while casting a spell "without paying its mana cost." 3WU: Until end of turn, Celestial Colonnade becomes a 4/4 white and blue Elemental creature with flying and vigilance. It's still a land. Once Celestial Colonnade has attacked, tapping it for mana won't remove it from combat. If Celestial Colonnade can't attack unless you pay a cost that includes a mana payment, you may attack with it and tap it to pay for that cost. It will still attack in this case. Circular Logic is still on the stack while you count the number of cards in your graveyard. It doesn't count itself. You divide the damage as you cast Conflagrate, not as it resolves. Each target must be assigned at least 1 damage. You can't choose more than X targets and assign 0 damage to a target. If X is 0, Conflagrate has no targets and deals no damage. If some of the targets become illegal for Conflagrate, the original division of damage still applies, but the damage that would have been dealt to illegal targets isn't dealt at all. If a spell has X in its mana cost, include the value chosen for that X when determining the converted mana cost of that spell, even if it was cast with flashback and no mana was spent on X. Containment Priest's last ability won't affect any creatures that were cast, including ones cast from unusual zones such as your graveyard. Containment Priest's last ability doesn't stop creature tokens from entering the battlefield. It also doesn't affect creatures that were already on the battlefield. If a noncreature card wasn't cast and is entering the battlefield as a creature (due to an effect such as that of March of the Machines), it will be exiled. Similarly, if a creature card wasn't cast and is entering the battlefield as a noncreature permanent (for example, Heliod, God of the Sun with insufficient devotion), it won't be exiled. If Containment Priest enters the battlefield without being cast, its ability won't exile itself. If Containment Priest enters the battlefield at the same time as other creatures, its ability won't affect those creatures. Players don't have priority to cast spells and activate abilities between combat damage being assigned and being dealt. This means that if you want to return Conviction to its owner's hand before combat damage is dealt, you must do so before combat damage is assigned (and the creature will no longer get +1/+3). Because damage remains marked on a creature until it's removed as the turn ends, nonlethal damage dealt to the enchanted creature may become lethal if you return Conviction to its owner's hand during that turn. A spell that can't be countered is a legal target for Countersquall. The spell won't be countered when Countersquall resolves, but its controller still loses 2 life. The triggered ability triggers both when Crow of Dark Tidings enters the battlefield and when it dies. You don't have to choose only one. Regenerate target creature. Draw a card. If the target creature is an illegal target by the time Dark Dabbling tries to resolve, the ability doesn't resolve. You don't draw a card and no creatures are regenerated. Dark Dabbling is still on the stack while you count the number of instant and/or sorcery cards in your graveyard. It doesn't count itself. Dark Dabbling's spell mastery ability is a normal spell effect, not a replacement effect. This means that if you replace drawing a card for Dark Dabbling's effect with dredging a card from your graveyard, the cards put into your graveyard this way may enable the additional regeneration. Dark Depths really is a land with no mana ability. It doesn't tap for colorless mana. The last ability of Dark Depths is a state trigger. It won't trigger again while the ability is on the stack, but if the ability is countered and Dark Depths is still on the battlefield with no ice counters on it, it will trigger again immediately. If Dark Depths leaves the battlefield before its triggered ability resolves, you won't be able to sacrifice it, so you won't create Marit Lage. Dawn Charm's third mode can target a spell that has multiple targets, as long as at least one of those targets is you. If multiple Auras are entering the battlefield at the same time, you choose which player or permanent each enchants before any of them enter the battlefield. This means that Daybreak Coronet can't be put onto the battlefield enchanting a creature that's not enchanted before the Auras all enter the battlefield. T, Put the top card of your library into your graveyard: Add C.
If you activate Deranged Assistant's ability while casting a spell, you can't choose to rewind the ability once you see the card that was put into your graveyard. You put the -1/-1 counter on Devoted Druid as a cost to activate its ability, not when it resolves. If paying the cost causes Devoted Druid to have 0 toughness, it's put into your graveyard before you can untap it and before you can even pay the cost again. If you can't put -1/-1 counters on Devoted Druid (due to an effect such as that of Solemnity), you can't activate its second ability. If you can put counters on it, but that is modified by an effect (such as that of Vizier of Remedies), you can activate the ability even if paying the cost causes no counters to be put on Devoted Druid. If a spell has X in its mana cost, include the value chosen for that X when determining the converted mana cost of that spell, even if it was cast for an alternative cost and no mana was spent on X. If a creature has multiple instances of annihilator, each triggers separately when that creature attacks. For Emancipation Angel's triggered ability, the permanent to return is chosen as the ability resolves. No player may take actions between the time you choose the permanent and the time it's returned to its owner's hand. If Emancipation Angel is still on the battlefield as its triggered ability resolves, you may return Emancipation Angel itself. Emrakul's second ability triggers as you cast it, and that ability resolves before the spell itself. It resolves even if that spell is somehow removed from the stack. Emrakul can be targeted by spells that try to counter it (such as Ionize). Those spells will resolve, but the part of their effect that would counter Emrakul won't do anything. Any other effects those spells have will work as normal. "Colored spells" is not synonymous with "colored cards." For example, even though creatures are spells when they're cast, they're not spells when they're on the battlefield and can block Emrakul; and triggered abilities of permanents entering the battlefield (such as that of Banishing Light) can target it. Emrakul can't be the target of colored Aura spells, but colored Auras can be put onto the battlefield enchanting it. You can choose any value for X as you cast Engineered Explosives. The value chosen for X doesn't directly affect the number of charge counters Engineered Explosives enters the battlefield with, but it does let you pay more mana and thus spend more colors of mana to cast it. Colorless mana won't give Engineered Explosives another charge counter. Colorless is not a color. A token has a converted mana cost of 0 unless it is copying something else. If an instant or sorcery spell puts Eternal Witness onto the battlefield, its ability can target that card in your graveyard. Activated abilities contain a colon. They're generally written "[Cost]: [Effect]." Some keywords (such as equip) are activated abilities and will have colons in their reminder text. Faith's Fetters doesn't stop static abilities, triggered abilities, or mana abilities from working. A mana ability is an ability that produces mana, not an ability that costs mana. If the target permanent is an illegal target by the time Faith's Fetters tries to resolve, the Aura spell doesn't resolve. It won't enter the battlefield, so its enters-the-battlefield ability won't trigger. In a multiplayer game, if a player loses the game, triggered abilities that player controls are removed from the stack and no more from that player can be added. This means that if a creature an opponent controls dies while you control Fecundity, and you lose the game before Fecundity's triggered ability resolves (perhaps because you lost the game at the same time that the creature died), that player won't draw a card. If Fiend Hunter leaves the battlefield before its first ability has resolved, its second ability will trigger and do nothing. Then its first ability will resolve and exile the target creature indefinitely. This is different from abilities on other cards that exile a permanent "until" something happens. If a token is exiled this way, it won't return to the battlefield. In a multiplayer game, if you lose the game, the creature exiled with Fiend Hunter remains exiled indefinitely. This is also different from abilities on other cards that exile a permanent "until" something happens. The converted mana cost of a split card is equal to the combined mana cost of its two halves. This means that the converted mana cost of Fire // Ice is 4. Once you cast it, the half you're not casting is ignored and the converted mana cost of the resulting spell is 2. A split card is a single card. For example, if you discard Fire // Ice, you've discarded one card, not two. If an effect counts the number of instant cards in your graveyard, Fire // Ice counts once, not twice. A split card has two names. 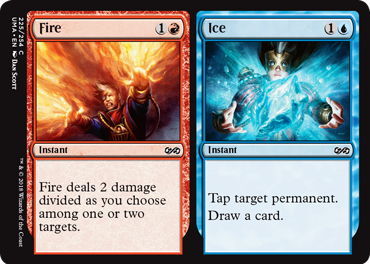 If an effect instructs you to choose a card name, you may choose Fire or Ice, but not both. You divide the damage as you cast Fire, not as it resolves. Each target must be assigned at least 1 damage. In other words, as you cast Fire, you choose whether to have it deal 2 damage to a single target, or deal 1 damage to each of two targets. If Fire targets two creatures and one becomes an illegal target, the remaining target is dealt 1 damage, not 2. If the target permanent becomes an illegal target for Ice, the spell doesn't resolve. You don't draw a card. 1RRR: Return Firewing Phoenix from your graveyard to your hand. Firewing Phoenix's ability can be activated only if Firewing Phoenix is in your graveyard. If the target creature is an illegal target by the time Flight of Fancy tries to resolve, the Aura spell doesn't resolve. It won't enter the battlefield, so its enters-the-battlefield ability won't trigger. You draw two cards and discard two cards all while Frantic Search is resolving. Nothing can happen between the two, and no player may choose to take actions. You choose which lands to untap while Frantic Search is resolving after you've discarded two cards. The lands to untap aren't targeted, and they don't have to be lands that you control. Fume Spitter can be the target of its own ability. The ability won't resolve since it won't have a legal target, and no counter will be put on any creature, but this does allow you to sacrifice Fume Spitter without another creature to target if you want to. Whenever you sacrifice another permanent, you may pay 2. If you do, Furnace Celebration deals 2 damage to any target. Furnace Celebration itself doesn't allow you to sacrifice any permanents. Its ability triggers whenever you sacrifice a permanent because something else instructed you to. You choose whether to pay 2 as the ability resolves, if that target is still legal. No player may take actions between the time you pay 2 and the time damage is dealt. You can't pay 2 more than once each time Furnace Celebration's ability resolves. Noncreature spells with X in their mana costs can't be cast. A spell's converted mana cost is determined only by its mana cost. Alternative costs (including casting a spell "without paying its mana cost"), additional costs, and cost reductions don't affect a spell's converted mana cost. You might end up discarding the card you searched for. Casting this spell is a gamble. Which creature cards to return to your hand is determined as Garna's triggered ability resolves. If Garna somehow finds its way into your graveyard before that, perhaps due to the "legend rule," it will be returned to your hand. T, Sacrifice Generator Servant: Add CC. If that mana is spent on a creature spell, it gains haste until end of turn. If the mana is spent on two different creature spells, each of those spells (and resulting creatures) will gain haste until end of turn. If a creature spell has generic mana only in its alternative or additional cost, the creature will still gain haste. An instant or sorcery spell is not a creature spell, even if that spell creates creature tokens. If the mana is spent on a noncreature spell that becomes a creature later in the turn, that creature won't have haste. 2B, Discard two cards: Return Ghoulsteed from your graveyard to the battlefield tapped. Ghoulsteed's ability can only be activated while it's in your graveyard. 1, Remove a +1/+1 counter from Golgari Grave-Troll: Regenerate Golgari Grave-Troll. If you return Golgari Grave-Troll from your graveyard directly to the battlefield, its first ability counts itself. Because damage remains marked on a creature until it's removed as the turn ends, nonlethal damage dealt to Golgari Grave-Troll may become lethal if you return remove +1/+1 counters from it during that turn. In this case, it dies before you can resolve the activated ability that will regenerate it. If the returned creature leaves the battlefield before the end step, it will remain in its current zone. It won't be exiled. To determine the total cost of a spell, start with the mana cost or alternative cost you're paying, add any cost increases, then apply any cost reductions. The converted mana cost of the spell remains unchanged, no matter what the total cost to cast it was. Hero of Iroas's first ability reduces only generic mana in the spell's total cost. Heroic — Whenever you cast a spell that targets Hero of Leina Tower, you may pay X. If you do, put X +1/+1 counters on Hero of Leina Tower. The amount to pay for X is chosen as the triggered ability resolves. No player may take actions between the time you pay X and the time Hero of Leina Tower has X +1/+1 counters on it. If Hissing Iguanar dies at the same time as another creature, Hissing Iguanar's ability triggers. Iridescent Drake's triggered ability can target any Aura card in a graveyard. However, if the Aura can't be attached to Iridescent Drake, it remains in its owner's graveyard and doesn't enter the battlefield. In a multiplayer game, if a player leaves the game, all cards that player owns leave as well. If you leave the game, the Aura you control from Iridescent Drake's ability is exiled. A game that restarts immediately ends the preceding game. The players in that game then immediately begin a new game. No player wins, loses, or draws the original game as a result of Karn's ability. Players can't move cards between their deck and sideboard before the new game. The player who controlled the ability that restarted the game is the starting player in the new game. The new game starts like a game normally does: Each player shuffles their deck (except the cards left in exile by Karn's ability). Each player's life total becomes 20 (or the starting life total for whatever format you're playing). Players draw a hand of seven cards. Players may take mulligans. Players may take actions based on cards in their opening hands, such as those of Leylines. Karn's first and third abilities are linked. Similarly, Karn's second and third abilities are linked. Only non-Aura permanent cards exiled by either of Karn's first two abilities will remain in exile when the game restarts. After the pregame procedure is complete but before the new game's first turn, Karn's ability finishes resolving and the cards left in exile are put onto the battlefield. If this causes any triggered abilities to trigger, those abilities are put onto the stack at the beginning of the first upkeep step. Permanents put onto the battlefield due to Karn's ability will have been under the starting controller's control continuously since the beginning of that player's first turn. Creatures among them can attack and their activated abilities with T in the cost can be activated. Any permanents put onto the battlefield with Karn's ability that entered the battlefield tapped will untap during their controller's first untap step. No actions taken in the game that was restarted apply to the new game. For example, if you were dealt damage by Stigma Lasher in the original game, the effect that states you can't gain life doesn't carry over to the new game. Players won't have any counters or emblems they had in the original game. In a multiplayer game, any player who left the game before it was restarted with Karn's ability won't be involved in the new game. If a player leaves the game, all cards that player owns leave as well. If you leave the game, the permanents you control from Karn's ability are exiled. In a Commander game, each player puts their commander into the command zone before shuffling their deck, unless it was exiled with Karn. In that case, the commander remains in exile and will be put onto the battlefield when Karn's ability finishes resolving. The number of times a player has cast their commander from the command zone resets to zero. The amount of combat damage dealt to players by each commander is reset to 0. Kozilek's first ability triggers as you cast it, and that ability resolves before the spell itself. It resolves even if the spell is countered. If for some reason you can't win the game (because your opponent controls Platinum Angel, for example), you won't lose for having tried to draw a card from a library with no cards in it. The draw was still replaced. If two or more players control a Laboratory Maniac and each player is instructed to draw a number of cards, first the player whose turn it is draws that many cards. If this causes that player to win the game instead, the game is immediately over. If the game isn't over yet, repeat this process for each other player in turn order. Whenever you or a permanent you control becomes the target of a spell or ability an opponent controls, you may draw a card. Your opponents can draw a maximum of one card each on each player's turn. Subsequent card draws during that turn are ignored. If an opponent hasn't drawn any cards in a turn and a spell or ability instructs that player to draw multiple cards, that player will just draw one card. However, if the draws are optional, the player can't choose to draw, even if they could draw one card this way. Leovold will "see" cards drawn by opponents earlier in the turn before it entered the battlefield, although Leovold can't affect cards drawn before it entered the battlefield. For example, if an opponent draws two cards, then Leovold enters the battlefield, that opponent can't draw more cards that turn, but the two drawn cards are unaffected. Replacement effects (such as that of dredge or Laboratory Maniac's ability) can't be used to replace draws that Leovold disallows. However, if an opponent's first draw is replaced (by a dredge ability, for example), that draw didn't happen and Leovold won't stop the next draw. If you and a permanent you control each become the target of the same spell or ability an opponent controls, Leovold's ability will trigger twice. The same is true if two permanents you control become the target of the same spell or ability an opponent controls. You can activate Liliana's first ability even if some or all players will be unable to discard a card. When Liliana's first ability resolves, first the player whose turn it is chooses a card in hand without revealing it, then each other player in turn order does the same. Then all the chosen cards are discarded at the same time. When Liliana's third ability resolves, you put each permanent the player controls into one of the two piles. For example, you could put a creature into one pile and an Aura enchanting that creature into the other pile. A pile can be empty. If the player chooses an empty pile, no permanents will be sacrificed. As Living Lore enters the battlefield, exile an instant or sorcery card from your graveyard. Living Lore's power and toughness are each equal to the exiled card's converted mana cost. Whenever Living Lore deals combat damage, you may sacrifice it. If you do, you may cast the exiled card without paying its mana cost. If there are no instant or sorcery cards in your graveyard as Living Lore enters the battlefield, it will enter the battlefield as a 0/0 creature and be put into its owner's graveyard due to having 0 toughness. If an instant or sorcery spell puts Living Lore onto the battlefield, that spell is still on the stack while you choose a card to exile. You can't exile it with Living Lore. If Living Lore leaves the battlefield, the ability that defines its power and toughness will lose track of the exiled card. Its power and toughness are 0 in other zones. Similarly, if the exiled card somehow leaves exile while Living Lore is on the battlefield, it will become a 0/0 creature. Living Lore's last ability will trigger whenever it deals combat damage, no matter if that damage is dealt to an opponent, an opposing planeswalker, or a creature it's blocking or being blocked by. You choose whether to sacrifice Living Lore as that ability resolves. If Living Lore has already left the battlefield, perhaps because it was dealt lethal damage at the same time it dealt damage, you can't sacrifice it. You may cast a sorcery this way even if it's not your turn. If you cast a spell "without paying its mana cost," you can't choose to cast it for any alternative costs. You can, however, pay additional costs, such as kicker costs. If the card has any mandatory additional costs, such as that of Tormenting Voice, those must be paid to cast the card. The ability that defines Lord of Extinction's power and toughness works in all zones, not just the battlefield. If Lord of Extinction is in your graveyard, it will count itself. If an instant or sorcery spell deals damage to Lord of Extinction or lowers its toughness, that spell is put into its owner's graveyard before state-based actions are performed. That card will raise Lord of Extinction's toughness before the game checks to see if it dies. Maelstrom Pulse has only one target. Other permanents with the same name will be destroyed even if they have hexproof or protection. If the target permanent becomes an illegal target for Maelstrom Pulse, the spell doesn't resolve. Nothing is destroyed. The name of a creature token is the same as the creature types it was created with unless the token is a copy of another creature or the effect that created the token specifically gives it a different name. For example, a 1/1 red Elemental creature token created by Young Pyromancer and a 4/4 green Elemental creature token created by Walker of the Grove are both named "Elemental." If Maelstrom Pulse resolves but the target permanent isn't destroyed (perhaps because it regenerates or has indestructible), all other permanents with the same name as it will still be destroyed. 1, Sacrifice a nonland permanent: Magmaw deals 1 damage to any target. You can sacrifice Magmaw to pay the cost for its own ability. It still deals 1 damage to the target. You draw two cards and discard three cards all while the activated ability is resolving. Nothing can happen between the two, and no player may choose to take actions. Gain control of target creature until end of turn. Untap that creature. It gets +2/+0 and gains haste until end of turn. Malevolent Whispers can target any creature, even one that's untapped or one you already control. Gaining control of a creature doesn't cause you to gain control of any Auras or Equipment attached to it, even though those remain attached to it. You must follow the normal timing permissions and restrictions and pay its cost to cast Marang River Prowler from your graveyard. Marang River Prowler checks if you control a black or green permanent only as you begin to cast it. Once you begin to cast Marang River Prowler from your graveyard, it doesn't matter what happens to the black or green permanents you control. A card that's already revealed can be revealed to activate the ability of Martyr of Sands. Once you've revealed X white cards from your hand, it doesn't matter what happens to those cards. The value of X doesn't change even if they leave your hand. Any damage dealt to you by a Human will cause Mikaeus's ability to trigger, including noncombat damage dealt to you by a Human and damage dealt to you by a Human you control. If a Human deals damage to you at the same time that Mikaeus is dealt lethal damage, Mikaeus's triggered ability triggers. That Human will be destroyed even though Mikaeus has left the battlefield. If a non-Human creature you control without a +1/+1 counter dies at the same time as Mikaeus, that creature's undying ability granted by Mikaeus triggers and will return it to the battlefield. The +1/+1 bonus that Mikaeus gives to other non-Human creatures you control isn't a counter. It won't prevent undying from triggering. Create an X/X green Ooze creature token, where X is the greatest power among creatures you control. The value of X is the greatest power among creatures you control when Miming Slime resolves. If you control no creatures at that time, X will be 0, creating a 0/0 Ooze token that will be put into your graveyard as a state-based action (unless something else is raising its toughness). The power and toughness of the Ooze token is determined when Miming Slime resolves. It won't change as the greatest power among creatures you control changes. The creature returns to the battlefield without a +1/+1 counter on it. Any abilities that trigger when a creature enters the battlefield will trigger or not as appropriate before it receives the +1/+1 counter and resolve after it has received that counter. No player may take actions between the time the creature returns to the battlefield and the time you put a +1/+1 counter on it. W, T: Put target card from your graveyard on the bottom of your library. Activate this ability only if you control two or more white permanents. A land card that produces white mana, even a Plains, normally has no color. Once you activate Mistveil Plains's last ability, it doesn't matter if you lose control of some of your white permanents. Create two 1/1 red Elemental creature tokens, then flip a coin. If you win the flip, return Molten Birth to its owner's hand. If you win the flip, Molten Birth goes directly from the stack to its owner's hand. It never goes to a graveyard. The Myr Servitor that's the source of the triggered ability must still be on the battlefield when the ability resolves. If it is, all other Myr Servitor cards are returned from all graveyards to the battlefield under their owner's control. If it's not, no Myr Servitors are returned to the battlefield. Discard a card: Olivia's Dragoon gains flying until end of turn. You can activate the ability of Olivia's Dragoon more than once in a turn, even if it already has flying. You can activate the ability of Patchwork Gnomes more than once in a turn, even if nothing is about to destroy Patchwork Gnomes and even if Patchwork Gnomes is already tapped. Your life total can't change. Platinum Emperion's ability doesn't prevent damage. Rather, it changes the results of that damage. For example, if a creature with lifelink deals damage to you, you won't lose any life, but its controller will still gain that much life. Similarly, if a creature you control with lifelink deals damage to another player, that player will lose life but you won't gain any life. Abilities that trigger whenever damage is dealt to you will still trigger because that damage is still dealt, even though your life total doesn't change as a result. Spells and abilities that would normally cause you to gain or lose life still resolve, but the life-gain or life-loss part simply has no effect. You can't pay a cost that includes the payment of any amount of life other than 0 life. However, you can choose to be dealt damage, even though that damage won't result in your life total changing. If a cost would include causing you to gain life (like the alternative cost of an opponent's Invigorate does), that cost can't be paid. Effects that would replace having you gain life with some other event won't be able to be applied because it's impossible for you to gain life. Effects that replace an event with having you gain life (like Words of Worship's effect does) or having you lose life will end up replacing the event with nothing. If an effect says to set your life total to a certain number, that part of the effect won't do anything. If an effect would cause you to exchange life totals with another player, the exchange won't happen. Neither player's life total changes. In a Commander game, the damage dealt to you by commanders will still be counted, even if that damage doesn't cause you to lose life. If either target is an illegal target as Prey Upon resolves, no creature will deal or be dealt damage. 2RG: Until end of turn, Raging Ravine becomes a 3/3 red and green Elemental creature with "Whenever this creature attacks, put a +1/+1 counter on it." It's still a land. Each time you activate Raging Ravine's last ability, it gains an instance of the triggered ability. For example, if you activate the last ability twice and then attack with Raging Ravine, both of the triggered abilities it gained will trigger. It will get a total of two +1/+1 counters. Any +1/+1 counters put on Raging Ravine remain on it even after it stops being a creature. They'll have no effect until it becomes a creature again. Whenever a creature you control with power 2 or less attacks, Raid Bombardment deals 1 damage to the player or planeswalker that creature is attacking. The power of the attacking creature is checked only when the ability triggers. Once it triggers, Raid Bombardment will deal 1 damage to the appropriate player or planeswalker even if the creature's power changes before the ability resolves. If you attack with multiple creatures with power 2 or less, Raid Bombardment's ability triggers for each of them separately. A creature with 0 power can attack, as long as it doesn't also have defender. If the attacking creature leaves the battlefield before Raid Bombardment's triggered ability resolves, Raid Bombardment deals 1 damage to the player or planeswalker that creature was attacking before it left the battlefield. If a creature is attacking a planeswalker, and that planeswalker leaves the battlefield, that attacking creature can still be blocked. If it's unblocked, the attacking creature is still attacking. It simply deals no combat damage. If a card in a player's graveyard has X in its mana cost, X is considered to be 0. The amount of life you lose is determined by the converted mana cost of the card in your graveyard, not the creature once it's on the battlefield. You lose life after the creature is already on the battlefield. Any abilities it has that interact with loss of life, such as that of Platinum Emperion, apply to that loss of life. If any abilities trigger on the creature entering the battlefield, those abilities resolve after you lose life. If losing life results in you losing the game, those abilities won't resolve. In a multiplayer game, if a player leaves the game, all cards that player owns leave as well. If you leave the game, the creature you control from Reanimate is exiled. You may target zero, one, or two creatures. The creatures don't need to be untapped. If you target zero creatures, all that happens is you draw a card. If you target one creature and that target is illegal as Repel the Darkness resolves, the spell doesn't resolve. You don't draw a card. If you target two creatures and they're both illegal as Repel the Darkness resolves, the spell doesn't resolve; you don't draw a card. If just one target is illegal, the spell does resolve; the remaining legal target becomes tapped (if it's untapped at that time) and you draw a card. Reveillark's ability may target zero, one, or two creature cards in your graveyard. Each target must have power 2 or less. Reveal the top three cards of your library and put one of them into your hand. You gain life equal to that card's converted mana cost. Put all other cards revealed this way into your graveyard. If a card in a player's library has X in its mana cost, X is considered to be 0. Rise from the Tides is still on the stack while you count the number of instant and sorcery cards in your graveyard. It doesn't count itself. 4, T: Target creature can't be blocked this turn. Activating the second ability of Rogue's Passage after a creature has become blocked won't cause that creature to become unblocked. Damage that would be dealt to that player by a source with that name is prevented. Auras with that name can't be attached to that player. That player can't be the target of spells with that name. Runed Halo gives you protection from each object with the chosen name, whether it's a card, a token, or a copy of a spell. It doesn't matter what game zone that object is in. Runed Halo doesn't give your permanents protection from the chosen name, only you. You can still be attacked by creatures with the chosen name, even though they won't deal combat damage to you. You'll have protection from the name, not from the word. For example, if you choose the name Shapeshifter, you'll have protection from anything named "Shapeshifter," but you won't have protection from other creatures with the creature type "Shapeshifter." You must choose the name of a card, not the name of a token. For example, you can't choose "Saproling" or "Marit Lage." However, if a token happens to have the same name as a card (such as "Shapeshifter" or "Spark Elemental"), you can choose it. Discard a land card: Seismic Assault deals 2 damage to any target. If an effect instructs you to draw cards and then discard cards, you can't take actions in between. For example, if you have no cards in hand and cast Faithless Looting, you can't activate Seismic Assault's ability between the time you draw two cards and discard those two cards. Seize the Day can target a creature that's already untapped. If the target creature becomes an illegal target for Seize the Day, the spell doesn't resolve. There isn't an additional combat phase or main phase. If you somehow cast Seize the Day during an opponent's main phase, that opponent attacks during the resulting combat phase, since it's still that player's turn. If you somehow cast it not during a main phase at all, all that happens is you untap the target creature. Shielding Plax's last ability isn't the same as hexproof. If it enchants one of your opponent's creatures, your opponents can't target their own creature with spells or abilities. If the target creature is an illegal target by the time Shielding Plax tries to resolve, the Aura spell doesn't resolve. It won't enter the battlefield, so its enters-the-battlefield ability won't trigger. Shirei's ability only triggers if the creature's power immediately before leaving the battlefield is 1 or less, regardless of its power in your graveyard. Shirei's ability triggers if a creature you own with power 1 or less dies under another player's control. If Shirei leaves the battlefield and returns to the battlefield after a creature with power 1 or less is put into your graveyard, Shirei is considered a new object. The delayed triggered ability won't return the creature to the battlefield. Shirei's ability can't return any creatures that died before Shirei entered the battlefield. As a spell or ability an opponent controls resolves, if it would force you to sacrifice a permanent, you just don't. That part of the effect does nothing. If that spell or ability gives you the option to sacrifice a permanent (as Desecration Demon does), you can't take that option. If a spell or ability an opponent controls states something happens unless you sacrifice a permanent (as Mogis, God of Slaughter does), you can't choose to sacrifice a permanent. On the other hand, if a spell or ability an opponent controls instructs you to sacrifice a permanent unless you perform an action (as Killing Wave does), you can choose whether or not to perform the action. If you don't perform the action, nothing happens, since you can't sacrifice any permanents. Sigarda's ability affects only sacrifices. It won't stop a creature from dying due to lethal damage or having 0 toughness, and it won't stop a permanent from being put into its owner's graveyard due to the "legend rule." None of these are sacrifices; they're the result of game rules. Whenever a creature is put into your graveyard from the battlefield, you may pay 1W. If you do, return that card to your hand. Sigil of the New Dawn's ability triggers if a creature you own dies under another player's control. If a creature you own dies at the same time that Sigil of the New Dawn leaves the battlefield, Sigil of the New Dawn's ability triggers for that creature. Discard a card: Return Skywing Aven to its owner's hand. Skywing Aven's last ability can be activated only while it's on the battlefield. You can activate Skywing Aven's ability, then activate it again before that ability resolves. You may do this as many times as you'd like before resolving any of those abilities. If there is only one card in your library, you put it into your hand. As Slum Reaper's ability resolves, first the player whose turn it is chooses a creature they control, then each other player in turn order does the same, knowing the choices made before them. Then all the chosen creatures are sacrificed at the same time. If any player controls no creatures, that player simply doesn't sacrifice anything. Each other player still sacrifices a creature. Slum Reaper may be the creature its controller sacrifices for its own ability. If you cast a spell from a graveyard using its flashback ability, you can't pay other alternative costs (such as that of Foil). If you cast an instant or sorcery with X in its mana cost this way, you still choose the value of X as part of casting the spell and pay that cost. If an instant or sorcery card in your graveyard already has flashback, you may use either flashback ability to cast it from your graveyard. You may pay any optional additional costs the spell has, such as kicker costs. You must pay any mandatory additional costs the spell has, such as that of Tormenting Voice. For split cards, the flashback cost you pay is determined by the half you cast. If either target is an illegal target as Soul's Fire resolves, the creature won't deal damage. Any Aura card you find with Sovereigns of Lost Alara's second ability must be able to enchant the attacking creature as it currently exists. You need to check the Aura's enchant ability as well as any effects, such as protection, that would make it illegal to attach that Aura to the attacking creature. For example, if the attacking creature were an artifact creature with protection from blue, you could find an Aura with "enchant artifact," but you could not find a blue Aura. If you choose to search your library but no applicable Aura card is left in your library (or you choose not to find one), then nothing enters the battlefield and you simply shuffle your library. If the attacking creature has left the battlefield by the time Sovereigns of Lost Alara's second ability resolves, you can't put an Aura onto the battlefield this way. You may still choose to search your library just to shuffle it. Whenever a player discards a card, you may pay W. If you do, create a 1/1 white Spirit creature token with flying. You can't pay W multiple times to create more than one token each time you resolve Spirit Cairn's triggered ability. If a player discards a card during their cleanup step due to having too many cards in hand, any appropriate abilities that trigger on discarding that card (such as Spirit Cairn's ability) trigger. If this happens, those triggered abilities are put onto the stack and players receive priority in that cleanup step to cast spells or activate abilities (normally, no players may take actions during a cleanup step). Another cleanup step is created following that one. Choose a card name. Reveal cards from the top of your library until you reveal a card with that name, then put that card into your hand. Exile all other cards revealed this way, and you lose 1 life for each of the exiled cards. You don't have to choose the name of a card that's still in your library, or even a card that's in your deck at all. If no card with the chosen name is in your library, you exile your library and lose 1 life for each of those cards. If Squee isn't in your graveyard as your upkeep begins, its ability won't trigger. You can't take any actions during your turn before your upkeep begins. 1U, T: Create a 2/2 blue Homunculus creature token, then sacrifice a creature. The creature you sacrifice for the ability of Stitcher's Apprentice could be the Homunculus you've just created. It could also be Stitcher's Apprentice itself. You create a token and sacrifice a creature all while the activated ability is resolving. Nothing can happen between the two, and no player may choose to take actions. Any abilities that trigger on the Homunculus token entering the battlefield will resolve after you've sacrificed a creature. Target player shuffles up to four target cards from their graveyard into their library. Stream of Consciousness can't be one of the target cards you shuffle into your library. You choose the target cards; the target player doesn't. They may offer suggestions. You may target zero cards in any graveyard and have a target player simply shuffle their library. If you target any cards in a graveyard and those cards all become illegal targets, the target player simply shuffles their library. Spell mastery — If there are two or more instant and/or sorcery cards in your graveyard, you may cast Swift Reckoning as though it had flash. The number of instant and/or sorcery cards in your graveyard matters only as you begin to cast Swift Reckoning. Once it's cast, that number doesn't matter and will have no effect on Swift Reckoning resolving. If an effect allows you to cast Swift Reckoning from your graveyard, you need two other instant and/or sorcery cards in your graveyard to cast it as though it had flash. Talrand's triggered ability resolves before the spell that caused it to trigger, but after targets have been chosen for that spell. It resolves even if that spell is countered. The ability that defines Tarmogoyf's power and toughness works in all zones, not just the battlefield. If Tarmogoyf is in your graveyard, it will count itself. Tarmogoyf counts card types, not cards. If the only card in all graveyards is a single artifact creature, Tarmogoyf will be 2/3. If the only cards in all graveyards are ten artifact creatures, Tarmogoyf will still be 2/3. The card types that can appear on cards in a graveyard are artifact, creature, enchantment, instant, land, planeswalker, sorcery, and tribal. Legendary, basic, and snow are supertypes, not card types. If an instant or sorcery spell deals damage to Tarmogoyf or lowers its toughness, that spell is put into its owner's graveyard before state-based actions are performed. If that spell is the first of its type to enter a graveyard, it will raise Tarmogoyf's toughness before the game checks to see if Tarmogoyf dies. 2g/ug/u: Put the top two cards of your library into your graveyard, then return a nonland card of an opponent's choice from your graveyard to your hand. Tasigur's last ability doesn't target any card or player. You choose an opponent as the ability resolves and that player chooses a nonland card after you put the top two cards of your library into your graveyard. The chosen opponent can choose any nonland card in your graveyard, not just one of the cards that was just put there. Heroic — Whenever you cast a spell that targets Tethmos High Priest, return target creature card with converted mana cost 2 or less from your graveyard to the battlefield. T: Thermo-Alchemist deals 1 damage to each opponent. Thermo-Alchemist's triggered ability resolves before the spell that caused it to trigger. It resolves even if that spell is countered. Players can cast spells and activate abilities (such as Thermo-Alchemist's own activated ability) after the triggered ability resolves but before the spell that caused it to trigger does. In a Two-Headed Giant game, Thermo-Alchemist's activated ability causes the opposing team to lose 2 life. 2, T: Thespian's Stage becomes a copy of target land, except it has this ability. The copy effect created by the last activated ability doesn't have a duration. It will last until Thespian's Stage leaves the battlefield or another copy effect overwrites it. The permanent will no longer have the first ability of Thespian's Stage. A land's copiable values are those printed on it, as modified by other copy effects. Counters and other effects aren't copied. Notably, if you copy a land that is also a creature because of a temporary effect (such as Celestial Colonnade), Thespian's Stage will become just the "unanimated" land. Thespian's Stage doesn't become untapped when it becomes a copy, even if the target land is untapped. No enters-the-battlefield abilities of the land Thespian's Stage is copying will trigger. Thespian's Stage was already on the battlefield. Similarly, no "as this land enters the battlefield" or "this land enters the battlefield with" effects, such as that of Dark Depths, will apply. You can't target the same creature twice to put two +1/+1 counters on it. If Travel Preparations targets two creatures, and one of them is an illegal target by the time Travel Preparations resolves, you'll still put a +1/+1 counter on the other creature. Ulamog's ability triggers as you cast it, and that ability resolves before the spell itself. It resolves even if that spell is countered. If Ulamog's Crusher can't attack for any reason (such as becoming tapped or having just entered the battlefield), then it doesn't attack. If there's a cost associated with having it attack, its controller isn't forced to pay that cost, so it doesn't have to attack in that case either. When Undying Rage is put into a graveyard from the battlefield, return Undying Rage to its owner's hand. If the target creature is an illegal target by the time Undying Rage tries to resolve, the Aura spell doesn't resolve. It's put into its owner's graveyard from the stack, so its leaves-the-battlefield ability won't trigger. Unholy Hunger is still on the stack while you count the number of instant and/or sorcery cards in your graveyard. It doesn't count itself. Urban Evolution's effect allows you to play an additional land during your main phase. Doing so follows the normal timing rules for playing lands. In particular, you don't get to play a land as Urban Evolution resolves; Urban Evolution fully resolves first and you draw three cards, perhaps including a land you'll play later. The effects of multiple Urban Evolutions in the same turn are cumulative. They're also cumulative with other effects that let you play additional lands, such as the one from Explore. If you somehow manage to cast Urban Evolution when it's not your turn, you'll draw three cards when it resolves, but you won't be able to play a land that turn. Urborg's ability causes each land on the battlefield to have the land type Swamp. Any land that's a Swamp has the ability "T: Add B." Nothing else changes about those lands, including their names, other subtypes, other abilities, and whether they're legendary, basic, or snow. You can return a land card to your hand with Vengeful Rebirth. It just won't deal any damage to the target permanent or player if you do. If the target permanent or player becomes an illegal target but the target card in your graveyard doesn't, Vengeful Rebirth will still return that card from your graveyard to your hand, but it won't deal any damage. Vengeful Rebirth will then be exiled. If the target card in your graveyard becomes an illegal target but the target permanent or player doesn't, Vengeful Rebirth won't return that card to your hand and it won't deal any damage (because you didn't return a nonland card to your hand this way). Vengeful Rebirth will still be exiled. If both targets are illegal, Vengeful Rebirth doesn't resolve. It will be put into your graveyard. If you cast your second creature spell in a turn and Vengevine is in your graveyard, Vengevine's second ability triggers and goes on the stack on top of that spell. The ability will resolve, allowing you to return Vengevine to the battlefield before the creature spell resolves. The ability resolves even if that creature spell is countered. Vengevine's triggered ability works only if Vengevine is already in your graveyard as you finish casting your second creature spell in a turn and if it remains there until the ability resolves. Vengevine's triggered ability checks the spells you cast over the course of the entire turn, not just the ones you cast while Vengevine is in your graveyard. For example, if you cast a creature spell, then Vengevine is put into your graveyard, then you cast another creature spell, Vengevine's ability triggers. Vengevine's ability triggers only for the second creature spell you cast in a turn. It won't trigger for the third, fourth, or so on. It also doesn't matter how many noncreature spells you cast in a turn; the ability counts only the creature spells. As Vexing Devil's ability resolves, the next opponent in turn order (or, if it's an opponent's turn, that opponent) chooses whether to be dealt 4 damage, then each other opponent in turn order does the same. If any of them do, you sacrifice Vexing Devil. No player may take actions between the time an opponent chooses to be dealt damage by Vexing Devil and the time you sacrifice Vexing Devil. This means that you can't use a spell or ability (such as Turn to Mist) to stop Vexing Devil from being sacrificed if a player chooses to be dealt damage. You determine whether you'll draw one or three cards as Visions of Beyond begins to resolve. This means that if you have nineteen cards in your graveyard and use a dredge ability to replace the one card draw, you won't draw two more cards after that even though your graveyard now has twenty cards in it. At the beginning of your end step, you may gain life equal to the power of target creature you control. If an effect changes a creature's power "until end of turn," it will still have the modified power during your end step. Wandering Champion's ability doesn't trigger if you don't control a blue or red permanent immediately after it deals combat damage to a player. If the only blue or red permanent you control is a creature that's dealt lethal damage at the same time as Wandering Champion deals combat damage, Wandering Champion's ability triggers. If you don't control a blue or red permanent as Wandering Champion's ability resolves, you can't discard and draw a card. The blue or red permanent you control as the ability resolves doesn't have to be one you controlled as the ability triggered. Warleader's Helix deals 4 damage to any target and you gain 4 life. If the chosen target becomes an illegal target for Warleader's Helix, the spell doesn't resolve. You don't gain life. Wickerbough Elder enters the battlefield with a -1/-1 counter on it. G, Remove a -1/-1 counter from Wickerbough Elder: Destroy target artifact or enchantment. You must choose a target artifact or enchantment to activate Wickerbough Elder's last ability. You can't pay G just to remove a -1/-1 counter from it without a legal target. If an effect puts Wickerbough Elder onto the battlefield with one or more +1/+1 counters, its -1/-1 counter and one of those +1/+1 counters are removed as a state-based action before you can activate its ability. Young Pyromancer's ability resolves before the spell that caused it to trigger. It resolves even if that spell is countered. Magic: The Gathering, Magic, Rise of the Eldrazi, Khans of Tarkir, Ravnica: City of Guilds, Lorwyn, Shards of Alara, Theros, and Champions of Kamigawa are trademarks of Wizards of the Coast LLC in the USA and other countries. ©2018 Wizards.